I'm designing a circuit with an opamp buffer at the input, which runs of batteries. 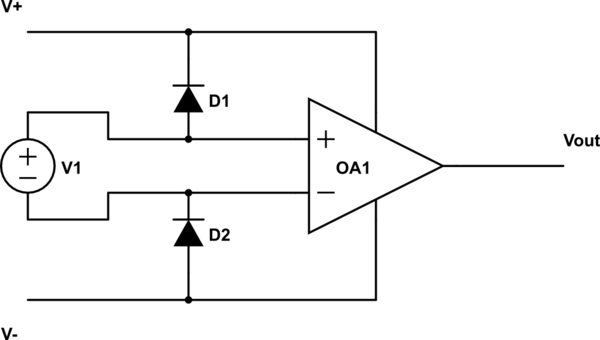 As the input does what it likes, the input of the opamp can see voltage even when the opamp is powered down. As the opamp inputs are rated at +0.5V V+ (rail) and -0.5V V-(rail), it is common practice to bolt diodes across the inputs of the opamps to the rails. My question is, where does this current go? Say the positive rail is at 0V and 5V is applied to the input, so the diode (seen in the diagram below) clamps at 0.7V. Well, this makes sense but it's a positive rail so it's not grounded, its just sitting there floating, so where does this current flow? Surely this will just cause the positive rail to flow to Vin-Vdrop = 4.3V. Same goes for the negative rail just vice versa. Can anyone explain how this works? I have attached supporting works below. Yes, it will tend to raise the voltage on the positive rail from zero to something else. The situation may be fine for the op-amp if the rail never exceeds a safe value, but it could cause other issues with other devices on the same rail. If you want to actually clamp it you should have some series resistance before and preferably after the diode and clamp the rail to some safe voltage if there is insufficient load on the supply to do so. For example, if you can put 10K resistors on the inputs you will only have 1mA flowing with 10V applied so that may be adequate protection without any external diodes at all. Keep in mind that an ordinary silicon diode will not prevent significant current from flowing through the protection diodes in the op-amp, the current will be shared to some degree. 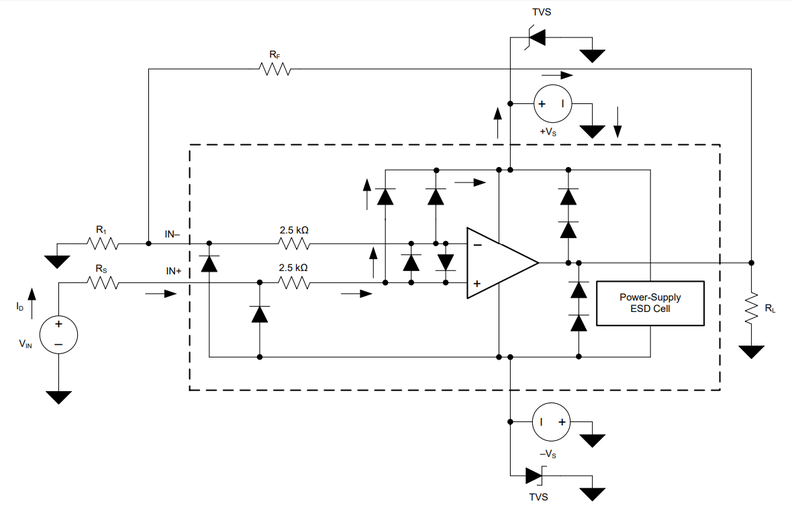 Adding a series resistor can help reduce the amount that flows through the op-amp inputs. Schottky diodes tend to have less forward drop at the same current so they will hog most of the current, however they are also very leaky in comparison so they can affect your analog circuit. Not the answer you're looking for? Browse other questions tagged operational-amplifier protection or ask your own question. How to deal with the opamp input offset in a circuit with multiple opamps with inputs connected together? Positive and Negative Sense Circuit. How/why does this work? Am I exceeding maximum ratings for the power rails of the opamp?